Moshpix: Trump Tower's signature restaurant, Sixteen (on the 16th floor), hosted a farmer's market Sept 2. 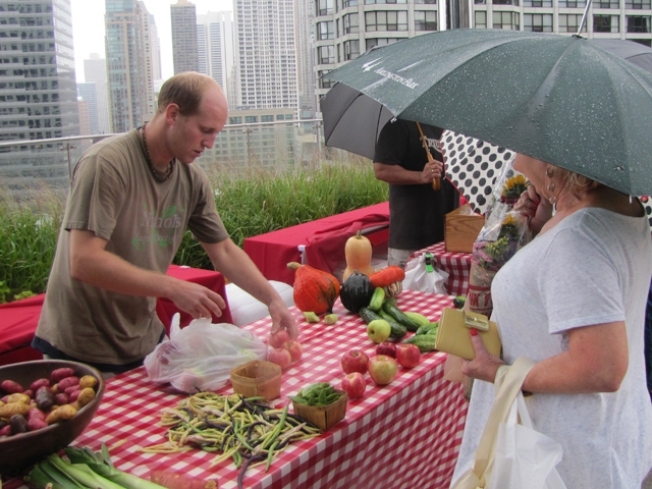 Although patches of rain showered on the event, nothing stopped Chicagoans from getting their local fruits and veggies. An apple a day? Apparently not in the United States. Most Americans still don't eat vegetables often enough, and fruit consumption is actually dropping a little, according to a new government report released Thursday. The Centers for Disease Control and Prevention found that last year about one-third of U.S. adults consumed fruit or fruit juice at least twice a day. That's down slightly from more than 34 percent in 2000. Only about 26 percent ate vegetables three or more times a day, the same as in 2000. The statistics come from a national telephone survey of hundreds of thousands of Americans. No state met federal goals of three-quarters of Americans eating enough fruit, and half eating enough vegetables. California ate the most fruit and Tennessee was best with vegetables. Oklahoma was at the bottom for fruit and South Dakota had the lowest vegetable consumption. The report did not ask people which fruits and vegetables they ate the most. But a CDC study published last year concluded that orange juice is the top source of fruit among U.S. adults and adolescents, and potatoes are the favorite vegetable. Health officials have been trying to promote fruits and vegetables -- especially leafy greens -- as healthy alternatives to salty, fatty and sugary foods. The goal is to curb the nation's obesity problem and reduce diabetes, heart disease and other maladies tied to bad diets. The 2009 data are discouraging, said Dr. Jennifer Foltz, one of the study's authors. "We aren't making progress, that's for sure," said Foltz, a CDC epidemiologist. However, the study was done before a new wave of government efforts to promote home and community gardens and to expand the sale of fruits and vegetables at stores. A survey planned for 2011 hopefully will show an improvement, she said.